How do they do it? Kids. 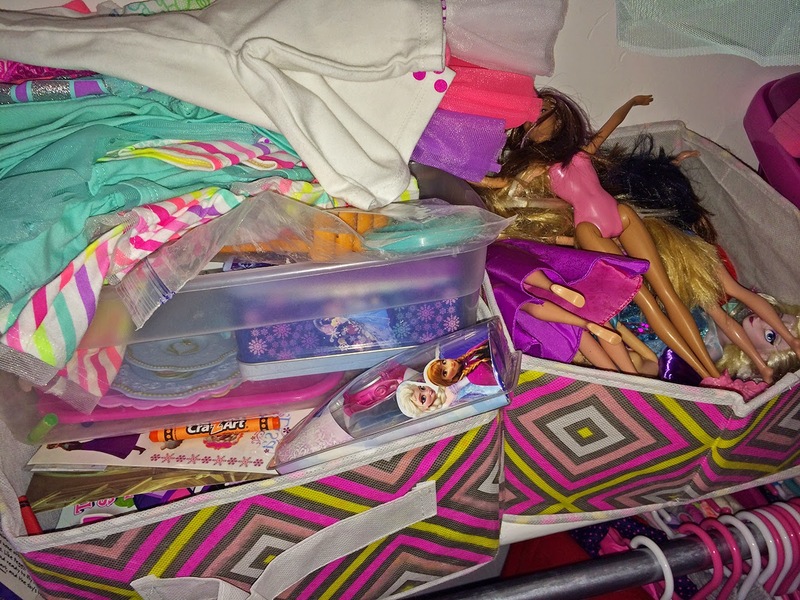 HOW do they manage the messes and chaos that only dolls, crayons, and kid's meal toys can create? It's quite the talent, really. 'Cause what's simpler than just tossing stuff in a big bin...right? 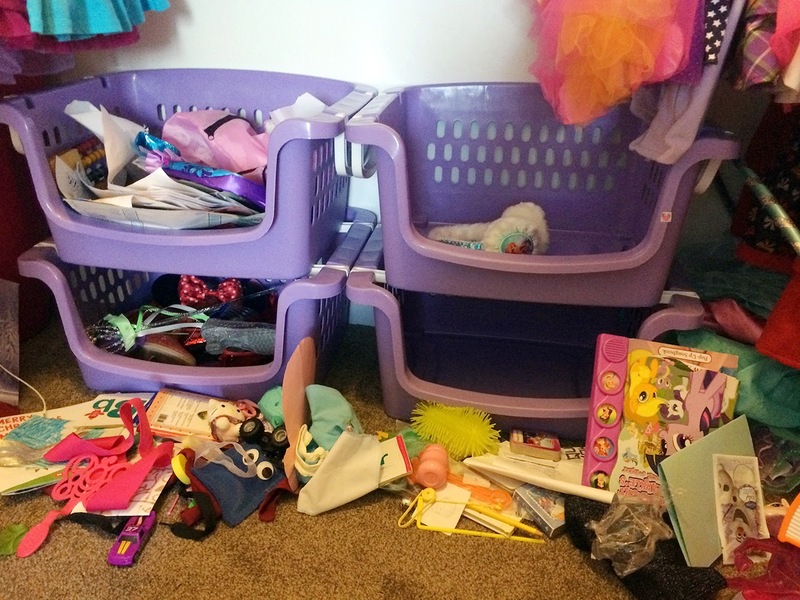 The problem was, everything ended up in the bins: dirty clothes, clean clothes, school papers, dolls, kid's meal toys, trash, blocks, books, you name it. 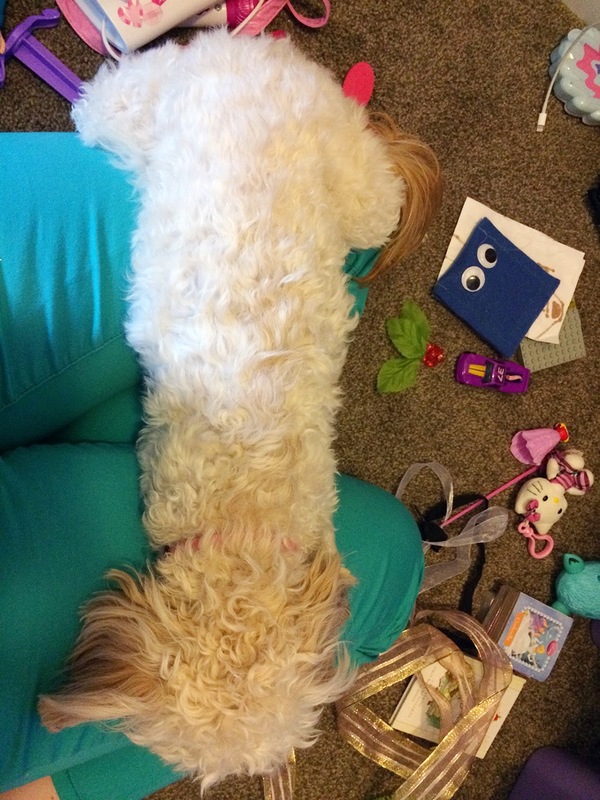 And of course, it was frustrating for Chloe to find her toys when she wanted something specific. I decided a simple bin approach was still a good idea, but with more options to corral the smaller items. 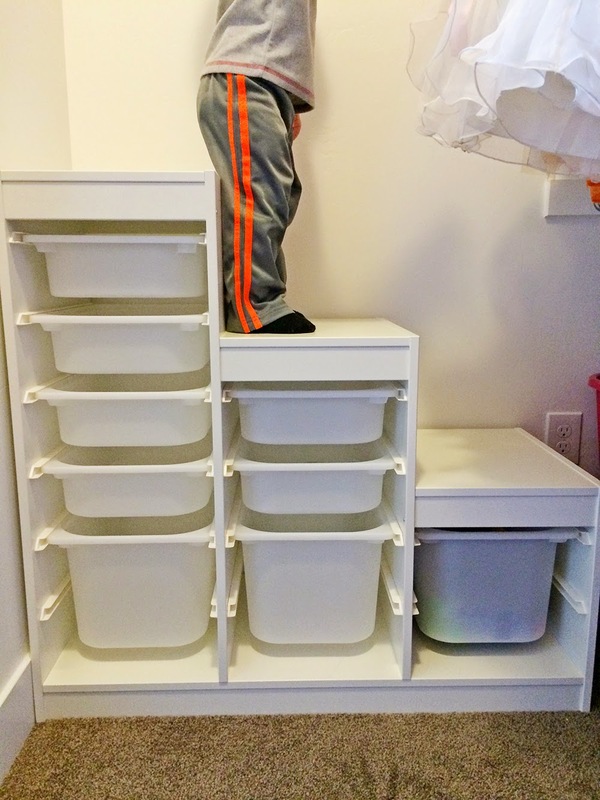 Ikea's Trofast system to the rescue - yay! 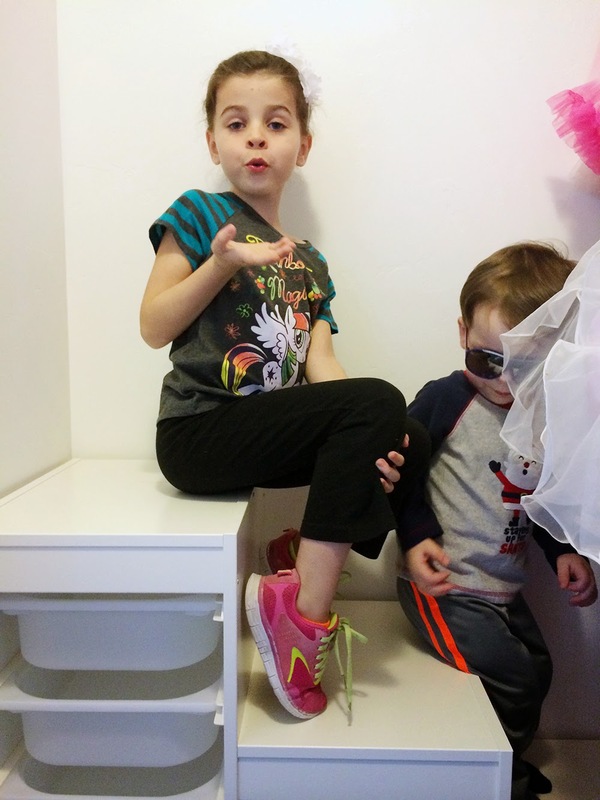 In addition to great organization, the Trofast also provides a particularly efficient step stool. And a fabulous stage from which to greet your fans. 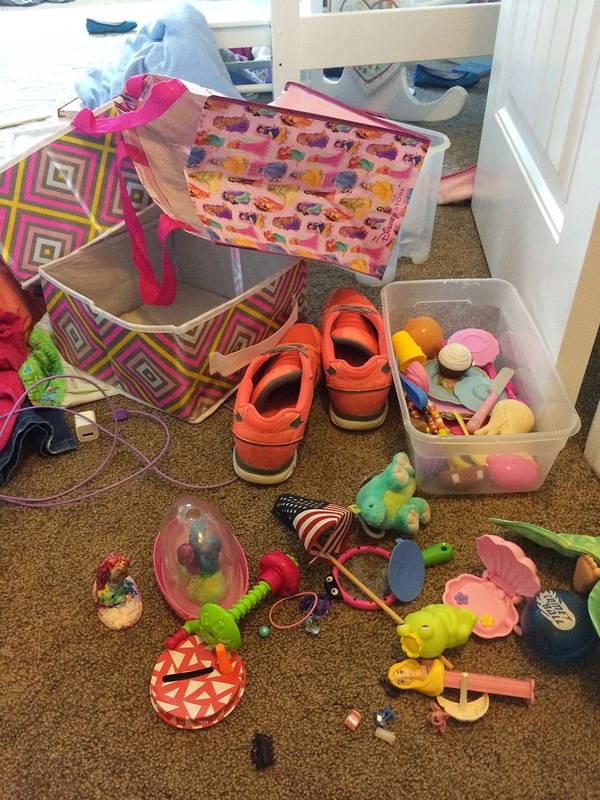 Now that Chloe's had plenty of time to test her newly organized toy closet, I can honestly say that the Trofast unit is kid-tested and mother-approved! 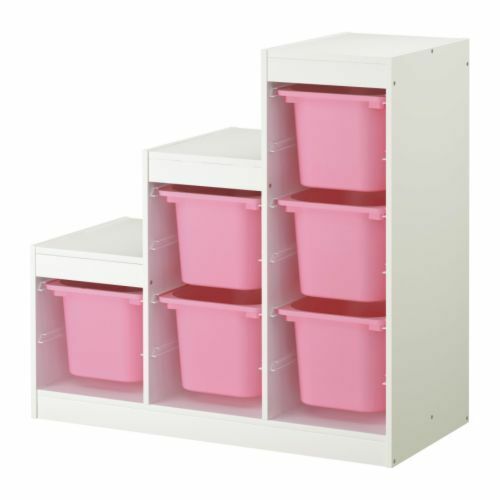 It's sturdy, relatively easy to assemble, and with three different bin sizes to choose from, you can really customize it to suit your needs. FYI - I decided to keep the four purple bins for dirty laundry, shoes, dress up accessories, and seasonal and dance wear (ear muffs, bathing suits, tap and ballet shoes). Having trouble getting started? Don't lose hope! My darling Chloe is a sentimental pack rat. Every little scrap of paper, happy meal toy, and broken thingamawhatsit has been assigned a special memory or emotional attachment. Getting her to part with anything is a struggle, but we're working on it! 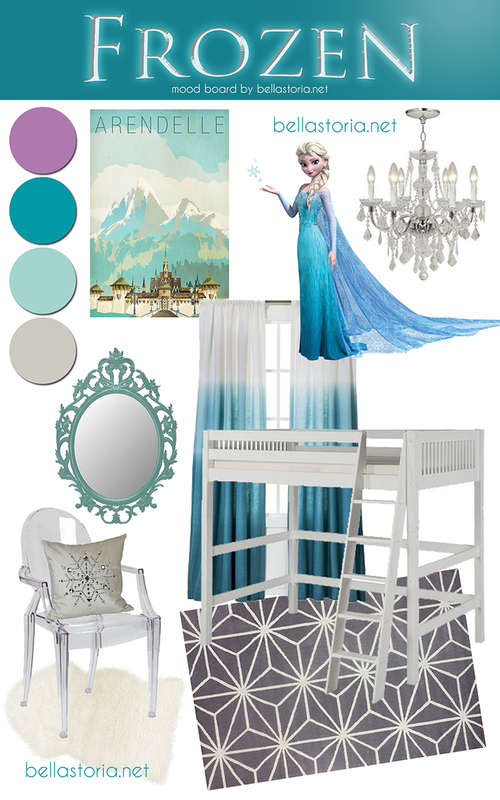 I'm hoping I can teach her that keeping only the truly useful, fun, and lovely will allow her to really enjoy her belongings, and keep her room a haven where she is free to play and use her imagination! 1. Keep it Simple - Young children (and us busy adults!) do best when their routines are simplified and consistent. I've found the trick to being organized is making it EASY to be organized! Keep your systems categorized so that you can find what you need, but simple enough that you don't get bogged down while trying to put things away. The worst thing to happen when creating an organizational tool is when you've created a system that's too complicated and cumbersome to use! 2. A Place for Everything - If you don't know where to put an item (does it have a specific home? a drawer? a bin?) it will likely stay where it is or get put in a big ol' pile of micellaneous stuff. My corner kitchen counter and mudroom will attest to this! Don't add to the clutter! Becoming more organized is a process. It most likely will NOT happen in an afternoon, weekend, or maybe even this month - and that's okay! 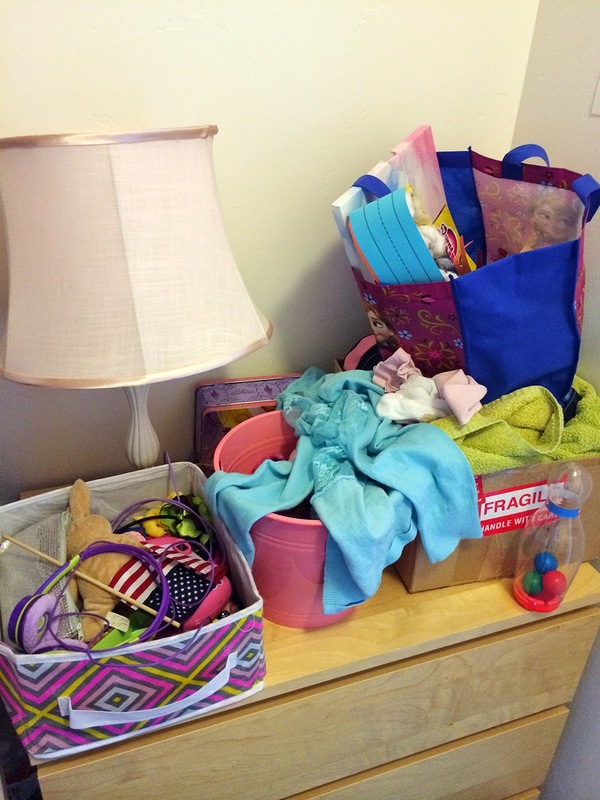 Start small with a corner, or a closet, and take everything out! Keep in mind what your daily routines are like, how you or your kids play and work throughout the day, and where things typically end up piled or disorganized. Create a simple solution from there, and as time goes by, remember to tweak the solution to meet you needs. 3. Rotate Toys - You've heard it before: Rotate your toys so that No.1 - Piles of toys don't get overwhelming and therefore never properly cleaned up; and No.2 - Kids don't constantly ask for new toys (or say, "Moooom, I'm bored! "), because you're keeping their interest with their current toys by not making them all available all the time! 4. Less is More - In ALL cases, the very best way to get organized is by starting out with less stuff! Many of us who find ourselves constantly overwhelmed by clutter and piles and mounds of laundry and stacks of paper and, and, and...are starting out with too. much. stuff! The stress, remorse, and feeling of helplessness is not unfamiliar to me, and for whatever reason you might be hanging on to things that are no longer useful, it's time to release yourself from this unnecessary burden! 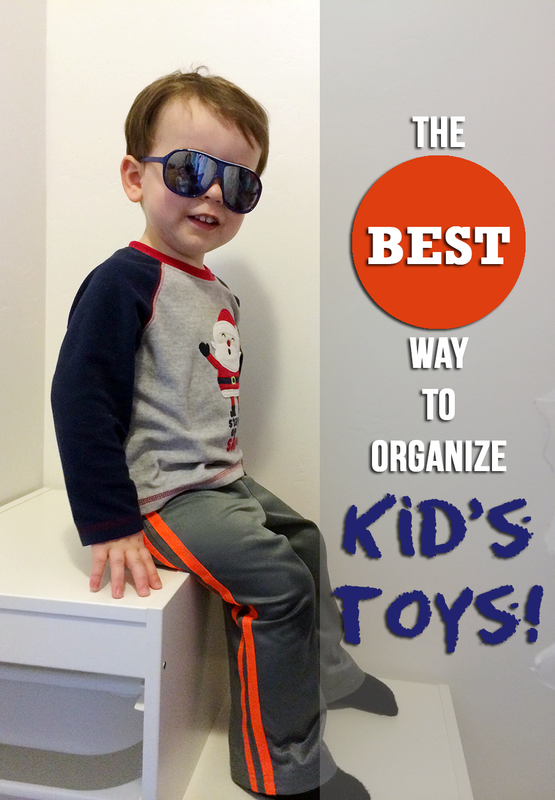 Q: Tell me about your favorite organizational systems for kiddos. Cubbies? Shelves? Canvas bins? Do you rotate toys? Do you have a "one in, one out" policy? Does your dog think she's human?